Betsy, a two year old mixed breed dog, was presented for a one day history of vomiting and unwillingness to eat. The owners note that Betsy had one episode of vomiting her dinner last night and was unwilling to eat her breakfast that morning. Since breakfast, Betsy had five episodes of vomiting progressing from undigested food to bile. Owners noted on two occasions, she vomited water ten minutes after drinking. On physical examination, Betsy was noted to be dehydrated and seemed uncomfortable when her abdomen was pressed on. 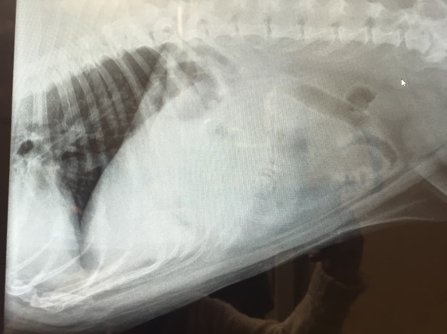 Due to the excessive vomiting and abdominal pain, it was elected to take x-rays of her abdomen. On x-rays, it was noted that her small intestines were mildly gas dilated and a foreign object was located in her stomach consistent with a baby pacifier. Please note the arrow indicating where the pacifier is located. Based on the presence of the foreign object and Betsy’s clinical signs, surgical removal of the pacifier was elected. An intravenous catheter was placed in Betsy’s vein and she was rehydrated with IV fluids prior to surgery. Once rehydrated, she was placed under general anesthesia and had her belly shaved and sterilely scrubbed to help prevent infection. A large incision was made into her abdomen and a full abdominal explore was performed. Foreign objects were felt in the stomach with no other abnormalities noted in the intestinal tract. A gastrostomy (surgical incision into her stomach) was performed and two baby pacifiers were recovered. Betsy remained in hospital for two days following surgery on intravenous fluids, intravenous antibiotics and injectable pain medications to ensure she remained comfortable while recovering. Betsy is doing wonderfully at home and she has taken a more hands-off approach on helping babysit.